19a. [Climate features of equatorial countries], SHORT WINTERS. Martin Short, Jonathan Winters. I’m reasonably certain that equatorial regions don’t really have winters. I asked a college classmate from Honduras how cold it got there during winter, and she looked at me like I had two heads. She may have mentioned a rainy season. 26a. [Savior, in popular parlance], WHITE HOPE. Betty White, Bob Hope. I hadn’t known that “white hope” was a phrase without “great” up front, but the dictionary says it is. The “popular parlance” clue sidesteps the phrase’s very ugly and racist history. Read filmmaker John Ridley’s NPR story about boxing, Jack London’s racism, and white riots in which dozens of people of color were killed. 35a. [Prognostication tool], CRYSTAL BALL. Billy C., Lucille B. 47a. [Clumps of sugar on a stick], ROCK CANDY. Chris R., John C.
40a. [First female Nobelist, 1903], CURIE. It bears noting that the very first Chemistry and Physics Nobels were given out a mere two years earlier. Furthermore, Marie Curie remains the only person (no man has done it) to receive Nobels in two different sciences. 60a. [Partied like it was 1999], WENT WILD. I was really hoping this answer would be more Prince-specific. 29d. [Two-time Grammy winner Bryson], PEABO. He and Regina Belle dueted on the Oscar-winning song “A Whole New World.” Most of Peabo’s biggest hits were duets. Guess everybody loves to sing with him. Surprised to see on a Tuesday: RIN, EFS, ROAN, RIA, ERST. Had a great time with Matt Jones this weekend at the ACPT. I also learned something: Matt is as good a solver as he is a constructor! It seems as if people at the tournament are either squarely constructors or solvers, and the ones that can do both well are a small group. Matt is definitely in that group! What I am most amazed at is the creativity that is shown to produce a clever puzzle every week. All of the great constructors seem to possess this talent, and it is the one I am most envious of! This week’s Jonesin’ is all about bridges; do you know where all of the bridges from the theme entries are? The Golden Gate Bridge is of course in San Francisco, the Tower Bridge is London. The Charles Bridge crosses the Vitava in Prague, and the Rialto Bridge is in Venice. The Brooklyn Bridge and the Tappan Zee Bridge are both in NYC. Funny clues, although it seems as if the word TAPPAN isn’t really clued, unless I am missing something. Still nicely done. A solid 3.9 stars today! 37A [“Game of Thrones” actress Chaplin] OONA – I have mentioned she is definitely crossword-famous before; I didn’t mention Game of Thrones starts Season 6 on April 24th! 63A [2014’s “The ___ Movie”] LEGO – This was really good. Highly recommended. NOT on Netflix. Yet! 64A [Short-lived NBC drama named for the outermost section of the Pentagon] E-RING – This show evidently did exist; I don’t remember it. 1D [“___ Jr.” (Pixar’s first film, featuring the lamps now used in their logo)] LUXO – Search for this on YouTube; I’m not sure I can embed it. You’ll recognize it when you see it! 9D [Stand-in] IMPOSTOR – Why did I think this ended in -ER? Because it can be either! 39D [How some sneak in] ON TIP-TOE – Favorite of the grid! I could go on, but I am still jet-lagged! My flight was delayed for 4 hours Sunday night! I should be OK by next week’s Jonesin’ puzzle! My only regret this past weekend at the ACPT was not being able to meet this constructor! She had a puzzle in the tournament, so I thought it might happen. Maybe next year! I am still in awe of the fact that English his not her native language! 33D [“The Court Jester” star] DANNY KAYE – Is this is most famous role? It sounds like “DK!” And yes, all the theme answers also have those initials. Nothing too complicated, but for the above reasons, I smiled widely! So for those reasons, a sparkling 4.4 stars today! 25A [“Moi?] WHO ME? – Reminds me of Miss Piggy first! A great entry. Not too common, either. 9 instances at xwordinfo.com in 20 years! 8D [[Don’t take me too seriously]] WINK WINK – This is even rarer. My favorite entry! 10D [Announcement from the foyer] I’M HOME – And another great entry! These all seem so natural. I am impressed! 39D [“He’s a priest,’ not a beast, per Ogden Nash] ONE L LAMA – A great poem. Nash is one of my favorite poems. He fits right in with my unculturedness! 61D [Ex-Dodger manager Mattingly] DON – OK, I have a minor quibble! Why not clue this as [Miami Marlins manager Mattingly]? Because that is his current position! Would that have made the clue harder? I appreciate all the kind words I heard this past weekend about my blog posts. Thanks to all; it means a lot. I am glad Amy asked me to help! I hope I can continue for a while! BTW, I finished 60th at the ACPT with one error in puzzle #3. There is room to improve! WEB feet from 17A. WEB JUNKIE [2013 documentary about internet addiction]. 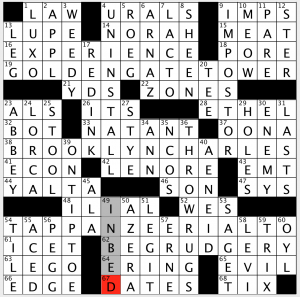 Now this title is totally inferrable from the clue and “gettable” from the crosses, but dollars-to-donuts you never heard of it before solving this puzz. Yes, it’s a documentary, but it was produced as a 74-minute TV episode for “Storyville,” which airs international documentaries. This one was filmed in China and had a 2014 screening at Sundance, where it earned a Grand Jury Prize nomination in the World Cinema–Documentary category. Still, it looks unlikely to me that it’ll be “playing at a theatre near you” anytime soon. Mainstream it ain’t. FLAT feet from 25A. FLAT BROKE [Cents-less?]. Perfect punny clue. I like that. COLD feet from 36A. COLD COMFORT FARM [Stella Gibbons novel]. More specifically, Stella Gibbons’s satirical, mock-Gothic novel. Stella Gibbons’s seriously funny novel adapted into a more than reasonably successful film of the same title. Either way, give it go! SQUARE feet from 58A. SQUARE ONE [Starting point]. Thematically speaking, this starting point brings things around to a fine ending point. 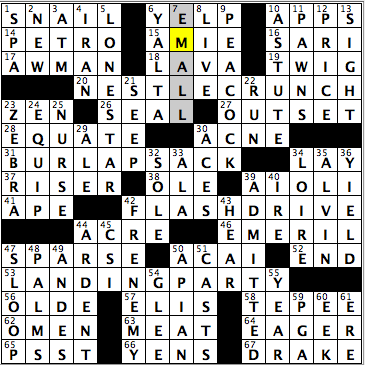 There’s a good deal of smile-making fill and clue/fill combos, too. 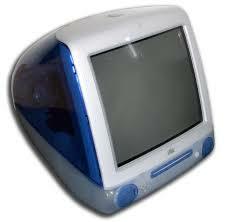 iMAC, circa 1998. 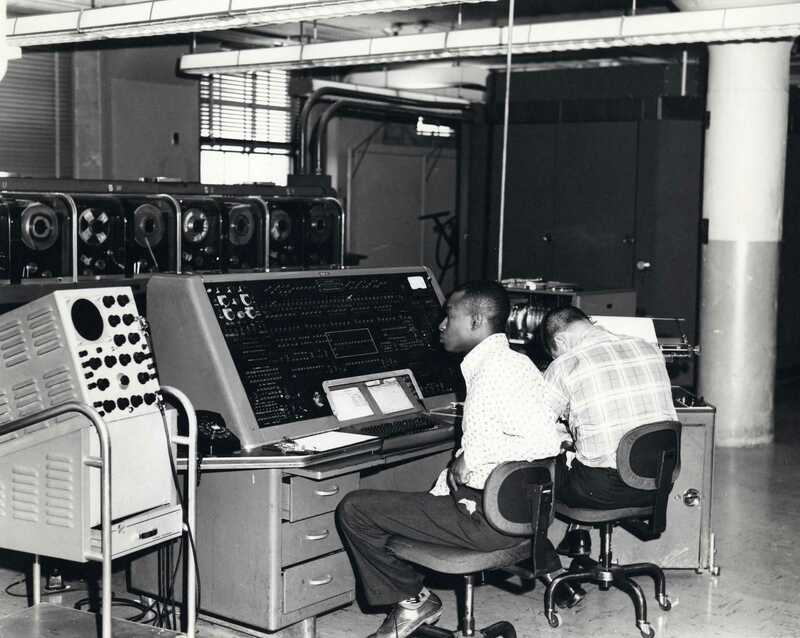 Not like today’s sleek design, but compare it to UNIVAC. Vive la différence! Not sure how I feel about the (subtle) duplication of IMAGES and CGI [Modern film effects, briefly], since that initialism stands for Computer Generated IMAGES. And while I’m definitely not in love with III or -ESQUE, I appreciate that the thoughtfully-wrought clues ([Junior’s junior] and [Kafka’s follower] once again work to improve the functional fill. And that’s it for today, folks. We had a March that coulda been April or May, and now an April that’s feeling a lot like late-February/early-March. Hope the weather is a tad saner where you are—and weather [sic] or not… keep solving! NESTLE CRUNCH (20A: [Candy bar containing crisped rice]) – Crunch time. BURLAP SACK (31A: [Rustic-looking bag made with jute]) – Sack time. FLASH DRIVE (42A: [It’s used to store information]) – Drive time. LANDING PARTY (53A: [Ship’s shorebound regiment]) – Party time. Instead of thinking about the Texas state flag when seeing LONE STAR, I thought about the brewing company (5D: [Texas flag symbol]). I’ve had Lone Star a couple of times, and it’s not a bad beer at all. We have a little bit of wildlife in this grid, with ZEBRA (23D: [One of two on the Botswana coat of arms]) crossing APE (41A: [Alarming way to go? ]), as well as the presence of PEACOCK, a sight that should make fans of NBC pretty happy (9D: [Bird with iridescent tail feathers]). Though I usually don’t solve for speed, I definitely did try to blitz through this grid today. And I did (comparatively speaking), so much so that I didn’t I had inputted one of the answers until after I was finished, which was AIOLI (39A: [Garlicky garnish]). Honestly, I had never heard of the terminology of E-MALL before, though I can definitely figure out what that is and what companies fall under that (7D: [Online shopping mecca]). “Sports will make you smarter” moment of the day: DRAKE (67A: [Male duck]) – Last night, the Villanova Wildcats completed a magical run in the NCAA Tournament with a buzzer-beating three-pointer to defeat North Carolina and win the championship. A magical run to a championship almost happened 47 years ago, when the DRAKE University men’s basketball team reached the Final Four in 1969. Standing in their way in the national semifinals were the dynastic UCLA Bruins, the two-time defending national champions coached by John Wooden and led by Lew Alcindor (a.k.a. Kareem Abdul-Jabbar). The Bulldogs (Drake’s mascot) only lost by three, 85-82, but then went on to win the third-place game against North Carolina. (Sorry, Tar Heels fans, for this entire post!) Want to see the highlights of Drake’s two games in the 1969 Final Four in Louisville? Well, you’re in luck! The video is priceless, as the atmosphere and sweater-wearing cheerleaders definitely takes you back! New byline today! Is it another pseudonym for editor Mike Shenk or a genuine debut? It might be a debut. It may be that this is a one-off puzzle aimed at one specific person (but I haven’t figured out who yet). The title suggests our theme is an offer to unite two businesses. But it’s not businesses we’re talking about. 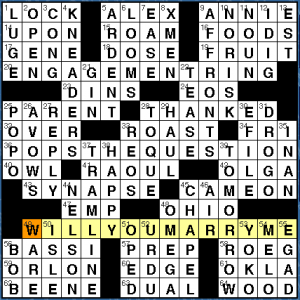 49a [Merger bid] WILL YOU MARRY ME? So if our constructor is asking the question, who is the target of his affections? Well, there’s ALEX at 5a and ANNIE at 9a. Also RAOUL, OLGA, NELSON, and YOKO. Plus a few surnames. But I don’t get the sense that this is an actual wedding proposal. None of the names stands out separately. I think this is just a theme. There have been actual proposals in other papers. Some of you may remember this one from 2011 which ran in the Washington Post with the help of veteran constructor Bob Klahn. In the UK, a Londoner proposed to his girlfriend in 2015 via the London Times. As to the rest of the puzzle, our long Downs are KNEADERS, AFFRONTS, TRAMLINE, and TOMORROW (nicely paired with ANNIE). Nothing terrible, but nothing terribly exciting in a grid with only three themers. The bottom two corners seem unusually cludgy. On the left we get EMP at 47a clued as [Augustus or Akihito: Abbr.]. Further down are BASSI, ORLON, and BEENE. Nothing egregious, but it feels like it could have been cleaned up a bit. The bottom right is worse though, primarily due to the crossing of 58a and 54d, ROEG and MELO. They are clued as [“Walkabout” director Nicolas] and [Knicks star Anthony, familiarly]. A pretty unfair crossing, in my opinion. 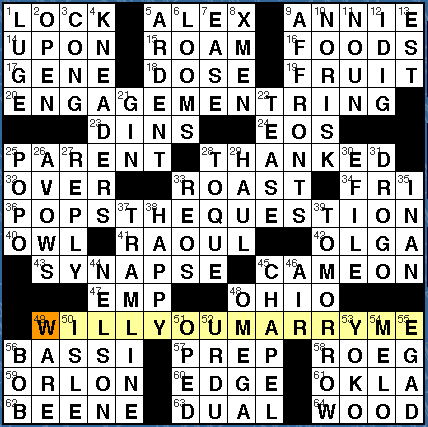 I had to run through all the vowels there, and E was my last choice. This could have easily been avoided with REAL, OTIS, and WINE (giving YETI, MAIN, and ELSE in the Down direction). So it seems like there’s something else going on here because a Shenk-edited grid is typically quite clean. Is it related to the theme? Is our proposee named ROEG or MELO. I don’t know. If this is part of the theme, I haven’t sussed it out. 31d [Daenerys’s late husband on “Game of Thrones”]. Nice to see Khal DROGO in the grid. Oh, and by the way, “Keith Etton” anagrams to “Tie The Knot”. So either Mr. Etton is a habitual marrier or Mike Shenk is having us on again. 17-A [American who was a spy for the Continental Army] = NATHAN HALE. Hanged for it, in New York City at age 21. 36-A [American who published the memoirs of his friend, Ulysses S. Grant] = MARK TWAIN. 50-A [American trumpeter, bandleader, and composer known for his jazz masterpiece “Kind of Blue”] = MILES DAVIS. 60-A [German-born American cartoonist who created the Republican Party elephant]. = THOMAS NAST. I’ve heard the word “nasty” comes from his name. Is this true? Let me look it up. False — in use since the 14th century. 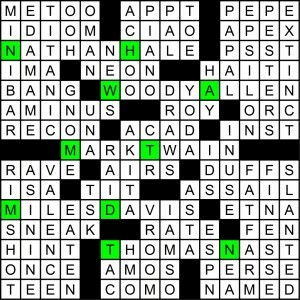 During my solve I noticed that each of the these five Americans’ initials are also the postal abbreviation of a state: NH, WA, MT, MD, TN. From the title, my first thought was to take the capitals of those states: New Hampshire’s capital is Concord, Washington’s is Olympia, Montana’s is Helena, Maryland’s is Annapolis, and Tennessee’s is…Knoxville? I have to look it up. Nope, Nashville. Had all those suckers memorized as a kid but not quite anymore! 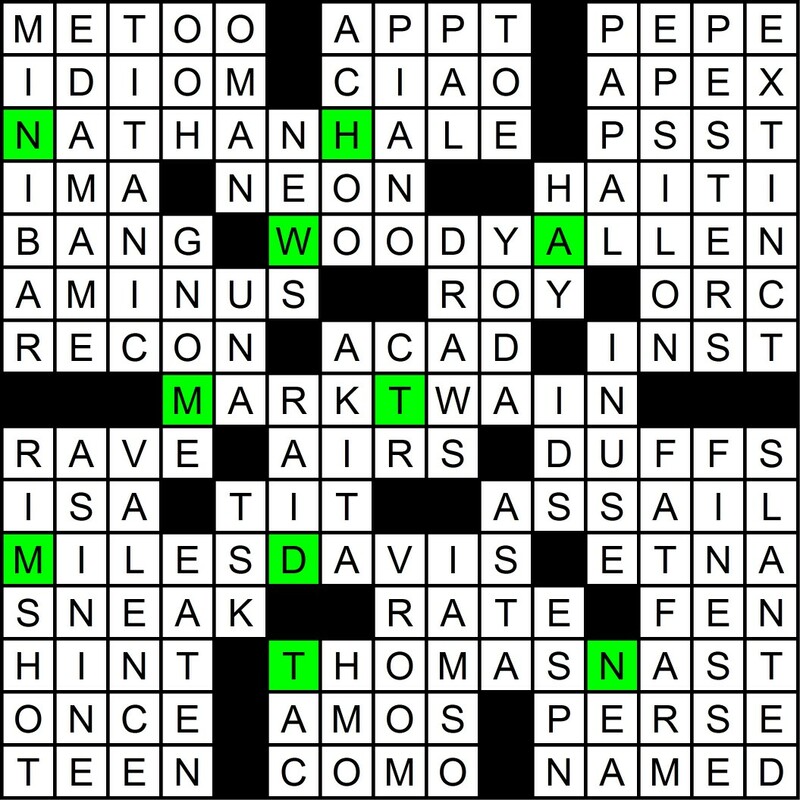 Take the first letters of those state capitals — note the nudge from the title, we want the capitalized letters — and you’ve got the surname of meta answer George M. COHAN. I can’t think of the relevance of Cohan right off the bat; if it were July I’d say this was a patriotic puzzle (Patrick was born on the 4th of July), but maybe there’s no extra relevance. Always looking for an extra layer in a Blindauer, even when there’s not one! But if there is and I missed it, let me know in comments. ***I had EDA???? 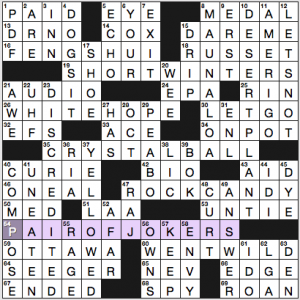 and without looking at the clue I was ready to fill in ED ASNER. 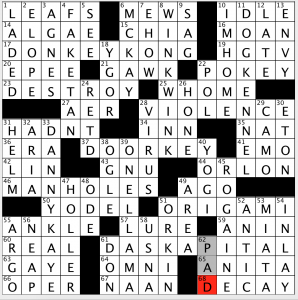 But then I looked at the clue. ***Lots of great fill: HAITI, YODA, parallel MINIBAR-EDAMAME-TITANIC, RIM SHOT, VROOM, GNOME, A-MINUS, PIANO, and APEX. ***I was about to e-mail the author that he had an error, since INST isn’t a [CIA sect.]. But then I realized that we’re talking here about the Culinary Institute of America. Fun stuff — 4.15 stars. This entry was posted in Daily Puzzles and tagged C.C. Burnikel, Dan Schoenholz, Elizabeth C. Gorski, Gail Grabowski, Keith Etton, Matt Jones, Patrick Blindauer. Bookmark the permalink. Wow. I couldn’t have been more off base with PB had I tried. I was looking for a sextet of states that contained the five listed. Had I thought of one the idea was to then come up with a famous American whose initials matched the missing state’s Postal Code. I even ran through the capitals looking for the commonality. I should’ve paid more attention to the title. I also went with the “look for the sixth postal abbreviation” as my strategy disregarding the title for the most part. I thought that Abraham Lincoln (Alabama) seemed about right with Grant, Republican Party, and Lincoln Center in Manhattan. The other two clues didn’t really fit, but my search was not very extensive. 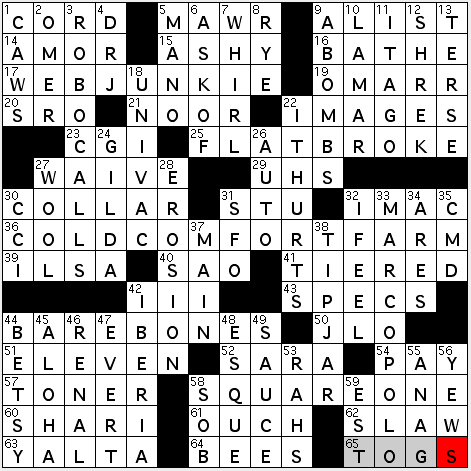 LAT: Derek, maybe the ex-Dodger clue for Don Mattingly was simply because it’s the Los Angeles Times puzzle? PB: Even though it’s not July, I assumed patriotism was part of the puzzle since Cohan’s most famous songs are Yankee Doodle Dandy, Grand Old Flag and Over There, but maybe I’m also just looking for that extra layer. I tried to punnily hint at a musician with “notable” (note-able), but no: there’s no special significance to the answer. The vowel options for the extraction used are pretty limited, so I was happy to find somebody that worked (and could use grid entries from the same category, not just any ol’ two-word phrases). Thanks for the write-up, MG. Certainly not as famous, but I was thinking the answer maybe the American yachtsman Don Cohan given his initials and the puzzle’s title and theme. Ooh–I like the way you think. Got Naticked at ROEG. Fine puzzle otherwise but agree that the SE corner was not pretty. In the Jonesin Bridges puzzle I thought Charles referred to the Charles River Bridge; y’know the span from Boston to Cambridge, MA. The WSJ was a proposal puz, after all. The byline (Keith Etton) anagrams to TIE THE KNOT.